4LP reissue of Led Zeppelin's celebrated live album! Led Zeppelin continue their reissue campaign with a new edition of their celebrated live album How The West Was Won, originally released in 2003, featuring newly remastered audio, which was done under the supervision of Jimmy Page. How The West Was Won highlights the best performances from Led Zeppelin's legendary concerts at the Los Angeles Forum and Long Beach Arena on June 25 and 27, 1972. 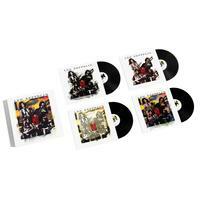 Melded together and sequenced to replicate a single concert from beginning to end, the 4LP collection captures the band at the height of its formidable powers. Standouts include a 25-plus minute version of "Dazed And Confused" and a 21-minute medley based around "Whole Lotta Love." The performances also capture the band introducing songs from its then-unreleased album Houses Of The Holy, which would be released nine months later. Led Zeppelin's members — Page, frontman Robert Plant, bassist/keyboardist John Paul Jones and drummer John Bonham — joined forces in the summer of 1968. The group released eight studio albums between 1969 and 1979, and has sold more than 200 million albums worldwide.